The SVG <text> element has many capabilities, and macSVG has user interfaces to work with many of the options. For example, SVG text can be aligned with a <path> element, and the <text> element can be animated on the <path>, and the <path> element itself can be animated and the <text> element will auto re-align itself to follow the animated path. 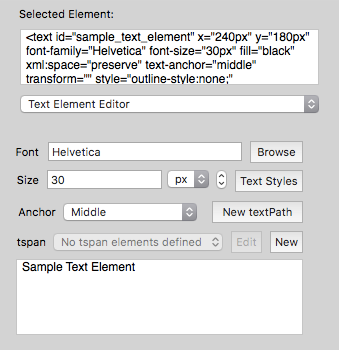 New <text> elements can be created by selecting the text tool in the SVG tool palette, editing the content of the text with the text Element Editor, then clicking in the web view to insert the new text element in the document. For some <text> element animations, the quality of the animation can be improved by adding a “text-rendering” attribute to the <text> element, and setting the value to “geometricPrecision”.